Laura Serman, Françoise and Andrew Skurman, Denis Bisson. Photo by Drew Altizer. 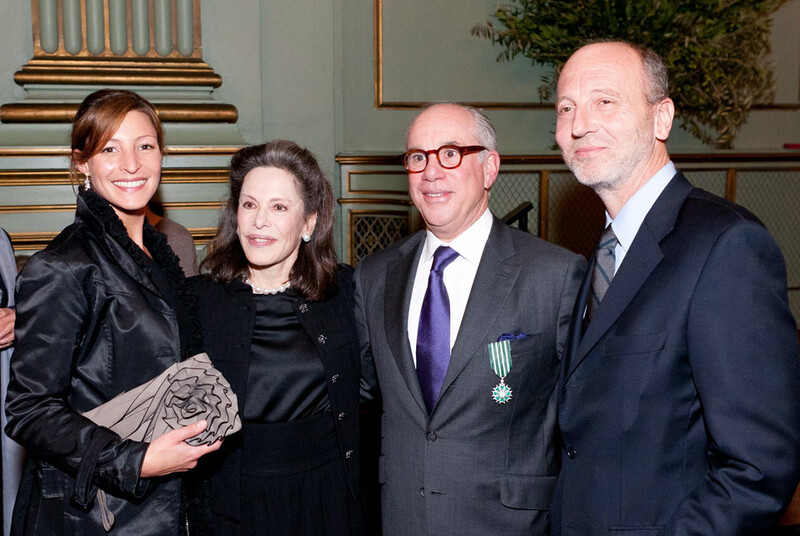 SAN FRANCISCO, CA.- Renowned classical architect Andrew Skurman was awarded France's Médaille des Arts et des Lettres (Medal of Arts and Letters) for his contribution to the promotion of French culture by Corinne Pereira, the Deputy Consul General of France in San Francisco. The ceremony, attended by more than 350 invitees, was held on November 22, in the prestigious Green Room of the a href="http://sfwmpac.org" target="_blank">San Francisco War Memorial. The Medal of Arts and Letters is awarded by the French Minister of Culture to citizens of France who have "significantly contributed to the enrichment of the French cultural inheritance." Select foreign nationals also have received the medal since it was established in 1957. The recipient of the award is admitted into the Order of Arts and Letters as a chevalier, or knight. Pereira, who spoke on behalf of the Consul general of France, Romain Serman, who had been unexpectedly called to Washington D.C., touched on the highlights of Skurman's prodigious architecture career. "We have gathered here in this beautiful Green Room to recognize and celebrate the achievements of Andrew Skurman, whose dedication to architecture and to the defense and illustration of the French Classical Style throughout his career has earned him not only the distinction that comes with this award, but the respect and admiration of the Beaux-Arts community, of his peers, and of course of his clients," she said. Skurman, who received his Bachelor of Architecture degree from Cooper Union in New York, has worked at some of the most prestigious architectural firms in the world. He started his career as an apprentice at the New York office of I.M. Pei. He subsequently worked at Skidmore, Owings and Merrill and at Gensler and Associates in San Francisco and Los Angeles before starting his own firm, Andrew Skurman Architects, in San Francisco in 1992. Skurman is a master of Classical architecture and he interprets its forms in the French, Georgian and Mediterranean styles, specializing in the design of high-end, well-crafted private residences. He is regularly invited to lecture on the subject at the University of California at Berkeley, Yale University and Cooper Union and has taught courses in interior architecture at California State University, Long Beach. He also is a member of the Council of Advisors of the National Institute of Classical Architecture and Classical America and currently serves as Creative Director of the San Francisco Fall Antiques Show. Before awarding Skurman with the medal, Pereira quoted his first client, Jerry Ganz, who was present at the Investiture: "When a young architect starts off on his own, it takes a lot of trust to ask him build a 16,800 square foot house. I already knew Andy from the firm where he had been working, and I knew that he had the ability to translate design into reality. The house that he designed was perfection. He later designed the White Apartment, which remains one of my favorite achievements, and I have built ten homes! I am happy that he loved it enough to buy it back from me and that he now lives in it."